The Washington Nationals head to Citi Field on Sunday, June 18, 2017 to take on the New York Mets. The expected starting pitchers are Joe Ross for the Nationals and Jacob deGrom for the Mets. The odds for this matchup have Washington at +133 and New York at -143. The Nationals have a 34-30-3 over/under mark and a 34-33-0 run line record. The Mets are 28-38-0 against the run line and have a 39-19-8 over/under record. The Nationals have a 41-26 overall record this season. Starting pitcher Joe Ross has a 3-2 record with an earned run average of 6.39 and a WHIP of 1.53. He has 43 strikeouts over his 43.2 innings pitched and he's given up 57 hits. He allows 11.7 hits per 9 innings and he has a FIP of 4.83. The bullpen has an earned run average of 5.21 and they have given up 198 base hits on the year. Teams are hitting .268 against the bullpen and they've struck out 180 hitters and walked 67 batters. As a team, Washington allows 8.5 hits per nine innings while striking out 9.2 batters per nine innings. They are 11th in the league in team earned run average at 4.17. The Nationals pitchers collectively have given up 566 base hits and 279 earned runs. They have allowed 88 home runs this season, ranking them 11th in the league. Washington as a pitching staff has walked 200 batters and struck out 613. They have walked 3 men per 9 innings while striking out 9.2 per 9. They have a team WHIP of 1.27 and their FIP as a unit is 4.10. As a team Washington is hitting .276, good for 3rd in the league. The Nationals hold a .475 team slugging percentage and an on-base percentage of .341, which is good for 3rd in baseball. They rank 2nd in MLB with 9.7 hits per game. Bryce Harper is hitting .320 with an on-base percentage of .425. He has 72 hits this season in 225 at bats with 51 runs batted in. He has a slugging percentage of .618 and an OPS+ of 169. Daniel Murphy is hitting .344 this year and he has an on-base percentage of .393. He has totaled 86 hits and he has driven in 45 men in 250 at bats. His OPS+ is 147 while his slugging percentage is at .564. The Nationals have 653 hits, including 134 doubles and 103 home runs. Washington has walked 229 times so far this season and they have struck out 516 times as a unit. They have left 473 men on base and have a team OPS of .816. They score 5.52 runs per contest and have scored a total of 370 runs this year. New York has a 30-36 overall mark this year. With an earned run average of 4.33, Jacob deGrom has a 5-3 record and a 1.40 WHIP. He has 100 strikeouts over the 81 innings he's pitched. He's also given up 79 hits. He allows 8.8 hits per nine innings and his FIP stands at 4.05. The bullpen has an earned run average of 4.76 and they have given up 249 base hits on the year. Teams are hitting .262 against the Mets bullpen. Their relievers have struck out 257 batters and walked 109 opposing hitters. As a team, New York allows 9.6 hits per nine innings while striking out 8.8 batters per nine innings. They are 25th in the league in team earned run average at 4.89. The Mets pitchers as a team have surrendered 639 base knocks and 327 earned runs this season. They have given up 92 home runs this year, which ranks 8th in Major League Baseball. New York as a staff has walked 251 hitters and struck out 591 batters. They give up a walk 3.8 times per 9 innings while they strike out 8.8 per 9. Their team WHIP is 1.48 while their FIP as a staff is 4.55. As a team, they are batting .246, good for 22nd in the league. The Mets hold a .439 team slugging percentage and an on-base percentage of .319, which is good for 21st in baseball. They rank 19th in MLB with 8.5 hits per contest. 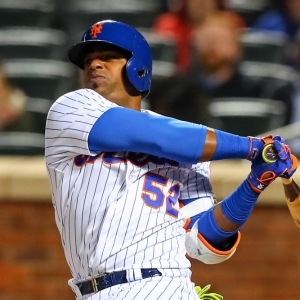 Yoenis Cespedes comes into this matchup batting .293 with an OBP of .379. He has 24 hits this year along with 15 RBI in 82 AB's. He maintains a slugging percentage of .622 with an OPS+ of 159. Michael Conforto is hitting .286 this season and he has an OBP of .406. He has collected 56 hits in 196 at bats while driving in 36 runs. He has an OPS+ of 157 and a slugging percentage of .577. The Mets as a unit have 560 base hits, including 123 doubles and 98 homers. New York has walked 232 times this year and they have struck out on 508 occasions. They have had 449 men left on base and have an OPS of .758. They have scored 4.88 runs per game and totaled 322 runs this season.